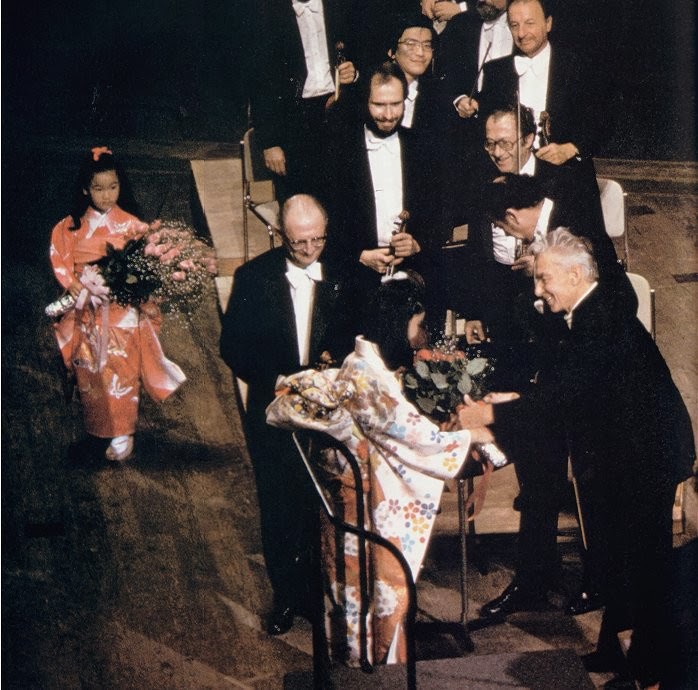 That photo of Karajan and the Berlin Philharmonic, which was taken on a tour of Japan in 1981, tells a different story to my 2008 post No flowers please for Herbert von Karjan. With the current fixation on attracting new audiences it is puzzling that the relationship between artist and audience is paid so little attention. In 1964 Benjamin Britten wrote about the "'holy triangle of composer, performer, listener", while nonlocality, which was anticipated by Einstein, formulated in Bell's Theorem, and confirmed by the Einstein-Podolsky-Rosen experiment, tells us that artist and audience are interdependent because the observer affects the observed. This interdependence was expressed very succinctly by the great Sufi master Rumi in these words: "The listener is the performer, and the performer is the listener". Yet the cult of celebrity and modern large concert halls have increased the distance between the listener and the performer, even though new audiences want their classical music up close and personal. When I was at the BBC in the 1970s I worked on the World Service Russian network and remember sitting in a studio in Bush House in the middle of the night during a broadcast wondering whether anyone was actually listening. These days I sit at my computer in rural Norfolk writing On An Overgrown Path and still wonder if anyone is actually listening. It is one of the paradoxes of the virtual world that despite my blog's traffic logs showing cumulative page views well into seven figures, the number of readers I have met face to face is still in single figures. Every communicator needs an audience, so, at the risk of being accused of self-aggrandisement, I am linking to two recent confirmations that not only does On An Overgown Path have an audience, but people are actually listening to what I am saying. One example comes, quite appropriately in view of the current state of classical music, from the UK's busiest comedy discussion forum; the other comes from David Derrick's The Toynbee convector, a long-running blog which reminds us that distance can bring wisdom to a subject such as classical music. Follow the links here and here.